← Why Is Our Government (and Deep State) So Incompetent? Even the father of free market economics – Adam Smith – didn’t believe that inequality should be a taboo subject. So how bad is it, really? Extreme inequality helped cause the Great Depression, the current financial crisis … and the fall of the Roman Empire . Bad government policy – which favors the fatcats at the expense of the average American – is largely responsible for our runaway inequality. And yet the powers-that-be in Washington and Wall Street are accelerating the redistribution of wealth from the lower, middle and more modest members of the upper classes to the super-elite. Defenders of the status quo pretend that this inequality is something outside of our control … like a force of nature. They argue that it’s due to technological innovation or something else outside of policy-makers’ control. In reality, inequality is rising due to bad policy. Inequality is not inevitable. It is not … like the weather, something that just happens to us. It is not the result of the laws of nature or the laws of economics. Rather, it is something that we create, by our policies, by what we do. When so much wealth accumulates at the top, with money comes the capacity to control politics… It’s not that people are rich, it’s that they abuse their wealth … The wealthy contribute to political candidates and the access that their contributions buy entrenches inequality by securing subsidies, bailouts and policies that lead to even greater inequality. The chairman of the Department of Economics at George Mason University says that it is inaccurate to call politicians prostitutes. Specifically, he says that they are more correct to call them “pimps”, since they are pimping out the American people to the financial giants. No wonder the government has saved the big banks at taxpayer expense, chosen the banks over the little guy, and said no to helping Main Street … while continuing to throw trillions at the giant banks. 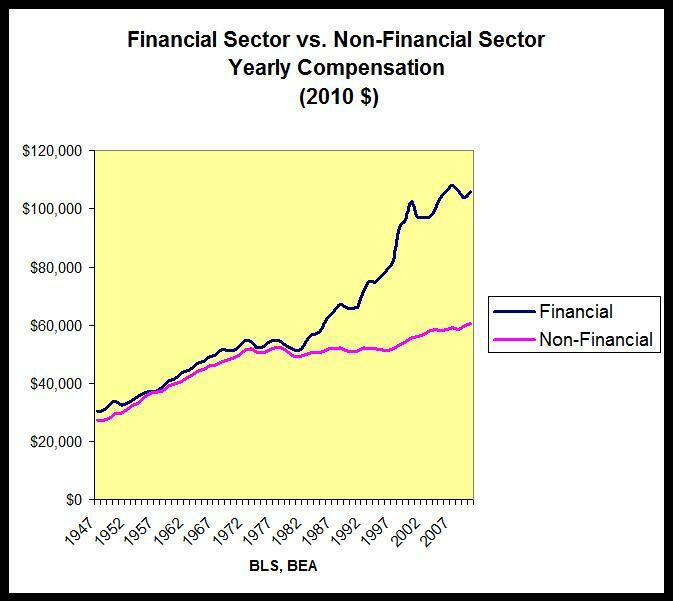 No wonder crony capitalism has gotten even worse under Obama than under Bush. No wonder big Wall Street players are continuing to loot taxpayer money and public resources. No wonder the big banks continue to manipulate every market and commit crime after crime and … and profit handsomely from it, while law-abiding citizens slide further and further behind. Yet Obama is prosecuting fewer financial crimes than Bush, or his father, or Ronald Reagan. Quantitative easing doesn’t help Main Street or the average American. It only helps big banks, giant corporations, and big investors. The Federal Reserve has been doing quantitative easing for 5 years … and inequality has shot up over the last 5 years. It’s not a coincidence. Massive subsidies to big corporations is also part of the problem. Indeed, some financial analysts say that the taxpayer subsidy to the giant banks alone is $780 billion per year. The average American family pays $6,000/year in subsidies to giant corporations. This is a direct transfer of wealth from the little guy to the big guy … which increases inequality. As CNN Money pointed out in 2011, “Wal-Mart’s core shoppers are running out of money much faster than a year ago …” This trend has only gotten worse: The wealthy are doing great … but common folks can no longer afford to shop even at Wal-Mart, Sears, JC Penney or other low-price stores. Americans know that the system is rigged against them. See this. We know that the government is giving Wall Street crooks a pass. 70% of Americans know that the government’s economic policies have thrown money at the banks and hosed the people. In such an environment, the average American has largely gotten out of stocks and other investments. A major source of inequality is unemployment, underemployment and low wages.